This work develops the theory that every language of the world can be traced back to the common basic principle of the bulge. This implies two elements, the concave and the convex bulge, which blend into a circle. Among others, terms like “swelling”, “billowing” or “distending” can be used as synonyms for this concept of the bulge, i.e. the unification of the concave and the convex curve into a circle takes place in a process of swelling, which consequently is the basis for the formation of the circle. 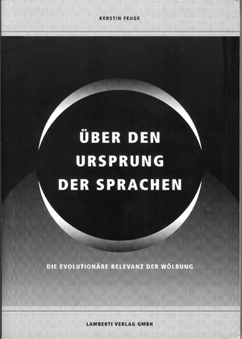 Thus the circle as the “Urbegriff” of human language is equal to the concept of swelling and therefore constitutes the basis of the genesis of words. So the circle symbolizing swelling is the fundamental structure of language and not only an entirely new linguistic approach, but also a strong argument for the so called “Proto World”, a protolanguage which is propagated by different researchers. This theory corresponds with the theses of the book „Origin – Development and first components of the human language“ of Lino Franceschini and thus confirms these. This is a strong indication of the idea that the basic principle of swelling is applicable to all languages of the world. This proto-world-language is not a hypothetical original language from which all known language families have developed, but a single common basic concept which has influenced the development of all languages. For the purposes of reasoning, the two largest language families of the world, the Niger-Congo and the Austronesian languages, are correlated and analyzed thoroughly . As a representative of the Niger-Congo languages, Proto-Bantu is examined. The languages which originate from Proto-Bantu are spoken in whole Southern Africa up to Sudan. As P.W. Schmidt once stated, the languages in this language region are of such a homogeneity that cannot be found in any other area of a comparable size. The Austronesian language family covers the huge area from the West-Eastern Axis of Madagascar to Easter Island and from Taiwan to New Zealand. The fact that both language families have only been transmitted orally for a long time indicates a very original character of this idioms. Therefore, they are exceedingly interesting for research and possess a key function for the study of language genetic relationships. Kerstin Feuge was born in Hamburg in 1963. She studied Austronesian languages and cultures as well as linguistics and phonetics. In 1990 she did her doctorate in phonetics.